Why is it easy to tip over some objects? If you want to tip something over you’ll have to rotate it. As you have seen, rotation means you need to apply a torque. An object sitting on a surface has several forces on it. First, is the gravitational force that acts on its center of gravity. Second, is the upward force of the surface. Third, is friction between the object and the surface that exists only if the surface is on a slant. Now suppose you exert a sideways force near the top of a box. That creates a torque and the box begins to rotate. If you now let go will the box continue to roll or will it go backwards? It depends on the relative locations of the center of gravity and the force of the surface as seen in the illustration above. 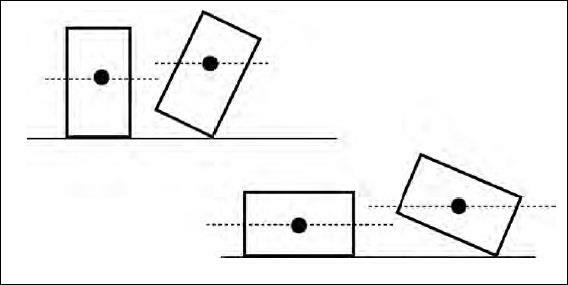 If the center of gravity is above the bottom of the box then the box will return to its upright position. If the center is directly above the corner of the box, then the box won’t rotate at all. If the center is outside the bottom of the box, then it will tip over.